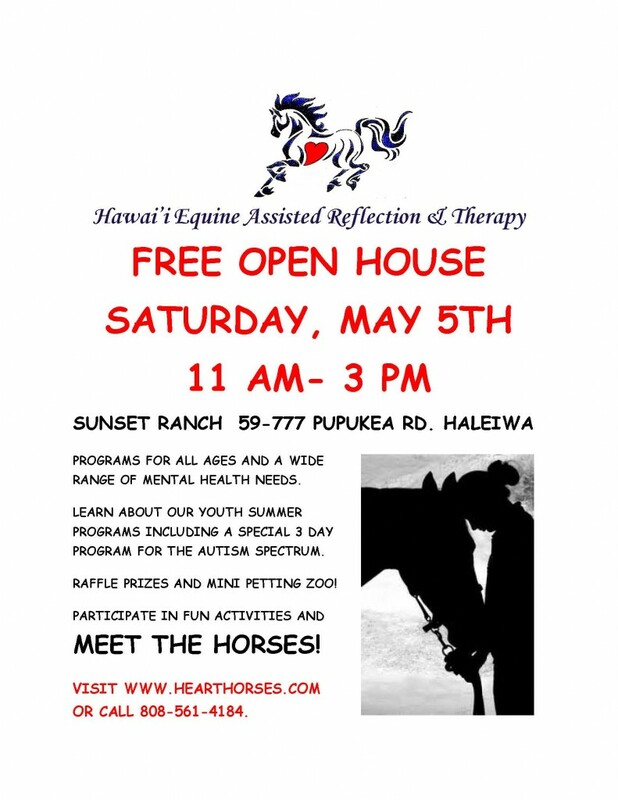 In an effort to continue to build meaningful Horsemanship programs at Sunset Ranch, we’re pleased to announce our partnership with Hawai’i Equine Assisted Reflection & Therapy LLC (HEART). HEART provides therapy programs for youth, adults, families, and other individuals and groups that incorporate horses for growth, learning and healing. While the HEART program offering includes unforgettable interactive experiences with horses; the ‘heart’ of their offering involves experiences in psychotherapy and learning that culminate in lasting and meaningful change for each and every participant. The HEART treatment philosophy resonates with the EAGALA model. HEART believes that their clients hold the best solutions for themselves. In the EAGALA model of Equine Assisted Psychotherapy (EAP) and Equine Assisted Learning (EAL), each therapeutic session is facilitated by an Equine Specialist and a Mental Health Specialist. Working with the horses as a team, HEART provides the opportunities to interact with horses, and then process these interactions with the client focusing on real solutions that are applicable to each individual. Please review our Sunset Ranch calendar for upcoming HEART demonstrations and programs. Sunset Ranch is hosting an OPEN HOUSE for HEART on Saturday, May 5, 2012. More details on this event can be found in the flier below. Come out and join us, and learn what HEART is all about! We are so pleased to be working with a company focused on doing so much good for the community of Hawaii. Please contact us with any questions, or for more information at (808)638-8333 or [email protected]. You can also contact Carina Cooper of HEART directly at (808)561-4184, or at www.hearthorses.com. Mahalo nui loa!